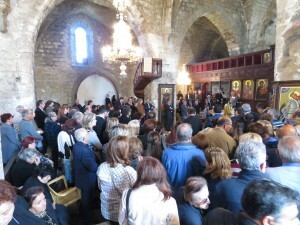 On Sunday 20th March 2016, on Orthodox day a Joint Holy Liturgy took place at the St. George Exorinos church within the medieval walled city of Famagusta, a Liturgy with two bishops, Athanasios of Limassol and Vasilios of Constantia/Famagusta. Many were the church followers, more than 600 Famagusta citizens and others who travelled from all the corners of unoccupied Cyprus in order to be at the church which we operate every month since December 2013. 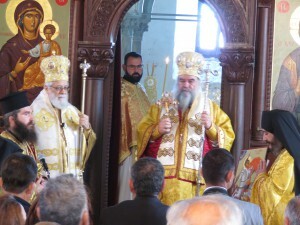 The Holy Liturgy was very emotional all through the Liturgy as well as during the Icon Litani of the Restoration of the Holy Icons. 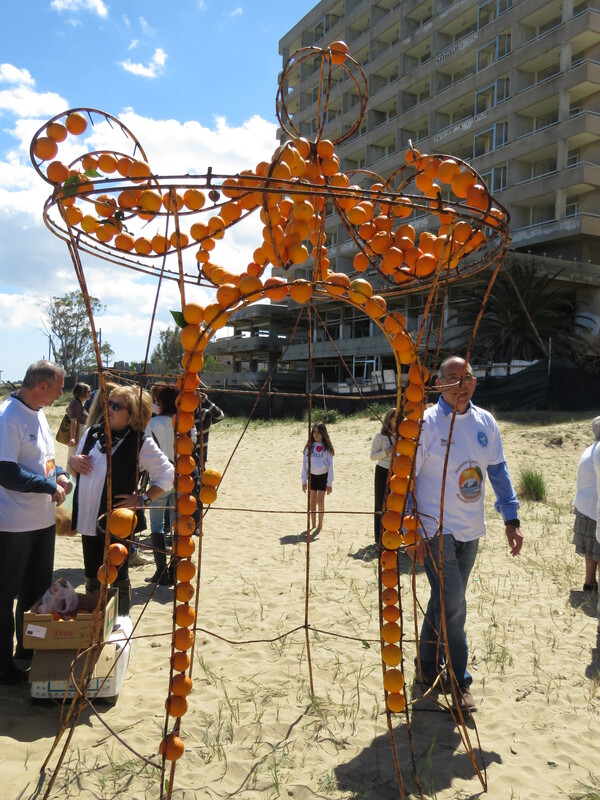 Following the Holy Liturgy all church followers made their way to the nearby Constantia beach, known as “Glossa Beach” for the planned event “Oranges…..Boats of Hope”. At the event the children’s choir “Island Light Children’s Choir” whose members are Turkish Cypriot children who attend primary schools in Famagusta sang for us. 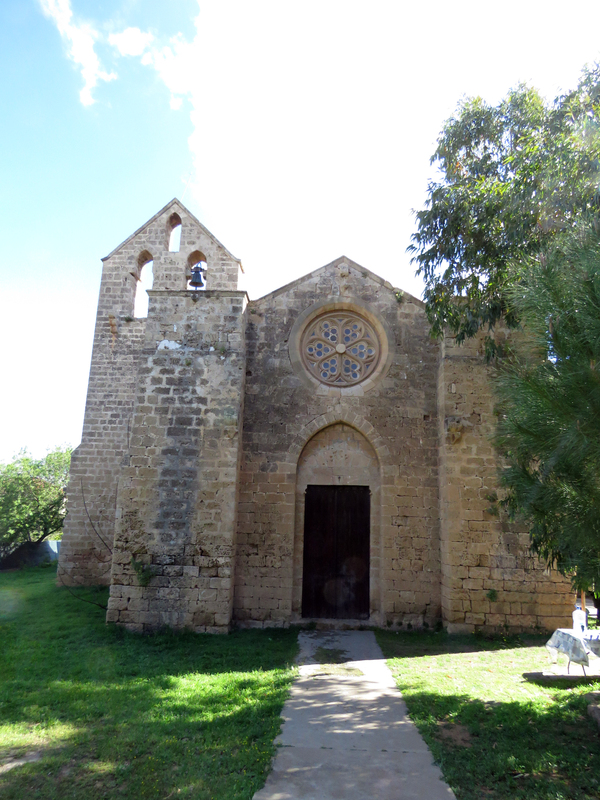 It was very emotional when people clapped rythmically at the TC children’s songs and the clapping echoed back from the empty deserted hotels right behind them, on the borders of the sealed off city of Famagusta. 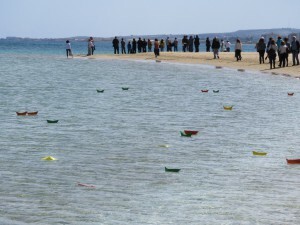 Following this the children set free in the crystal waters of Famagusta sea 42 little boats, as many as the refugee years, boats created with various peace and reunification messages, aiming that they reach the sealed off city of Famagusta which stoically awaits for peace and reunification on the island. The wind helped them travel beyond the barbed wire hence reaching their destination. 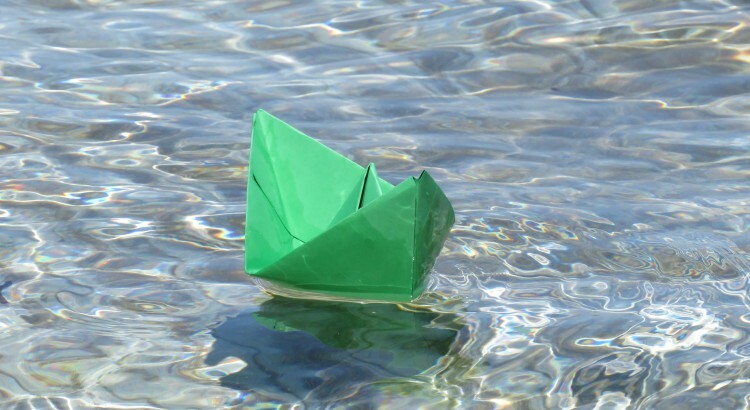 The boats gave another message too, as Nicos Karoullas of the initiative group “Famagusta Our Town” and Serdar Atai of the initiative group “Famagusta Initiative” which joinly organised the event said. 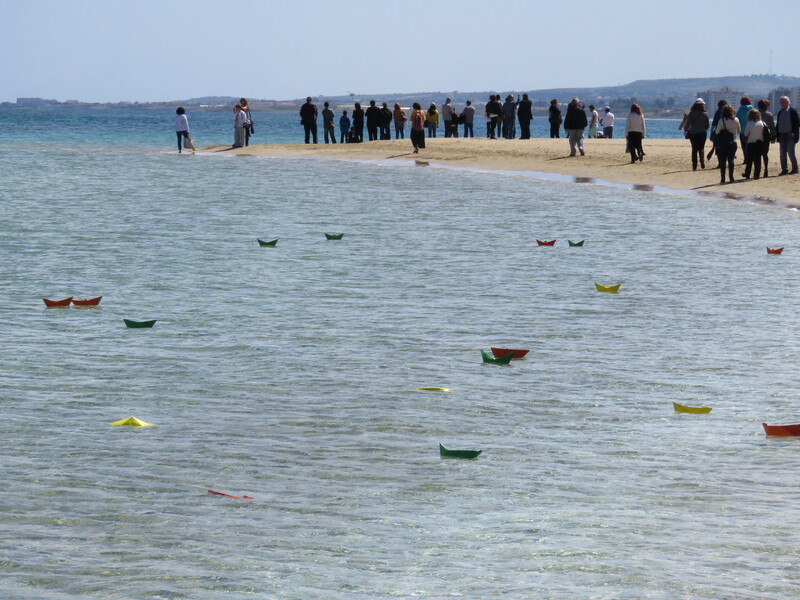 The boats symbolised the boats with which the Syrian Refugees arrive, seeking security away from the war in their country, with the wish that the peace we seek for in our island will also come to their country soon too. After the above there was a symbolic decoration with oranges of an old chariot which used to decorate the Municipal Park of Famagusta in the pre 1974 days, a chariot which TC painter Umit Inatchi found thrown in a piece of land, he saved and kept it until either the reunification of our country took place or in order to be used for an organised event for the famous Orange Festival which used to take place in Famagusta, something which has happened last year for the first time during which time he gave it to us. The event ended with two songs about Famagusta and Cyprus which were sang by the people there watching the sealed off city which again “answered back” with its echo. During both the Holy Liturgy and the event on the beach with us were many Turkish Cypriots who struggle with us for the Reunification of our island and the return of Famagusta to its lawful citizens.